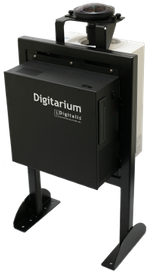 We will buy a digital planetarium system from Digitalis in Bremerton, WA. Below is a summary of its features. Additional technical specifications at ten of this page. 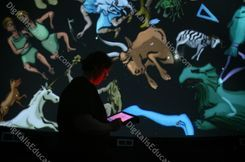 A digital planetarium system is a computer based system using digital projection. Think of the difference between a computer and a slide projector and you start to see the power of a digital system. In a digital system, the projected image is made up of individual pixels. 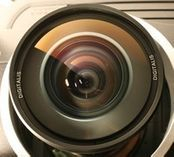 Because the dome is covered by an array of pixels rather than a fixed set of holes or lenses, anything can be projected: videos, images, other applications and labels. The system comes with 3 GB royalty free music and the ability to play an audio track in the background. The system has the ability to select a celestial object by name form a sortable, filterable, and searchable database. A digital system will show the sky as seen from anywhere in the database. For example, views of the earth from Saturn, our solar system seen from above, the black hole at the center of our galaxy, the galactic super cluster or any other digital file or video. We will be able to simulate the sky from any point of Earth or from other planets and moons, asteroids and comets. We can zoom in and out of anything in the entire sky. We can show constellation, line drawings and artwork including those from multiple cultures. The system comes with pre‐made presentations including a set of two dozen full dome videos. The system includes an integrated multimedia player and it has the ability to project directly from another computer. Volunteers with train JSD teachers and other to use the system. The system includes a Universal Console™ web‐based interface software. This console and hand held remote are easy to use. The system includes a set of high‐resolution data set of the solar system for spectacular planetary exploration. The system includes Nightshade, an astronomy simulation software used in all Digitarium systems. Easy, automated software upgrades over the internet keep the system up to date with the latest featu. The proprietary fisheye lens has a sharp focus, high contrast, and minimal color separation. System includes ability to simulate celestial phenomena such as transits, eclipses, meteor showers and annual motion. You can labels and zoom in on any object in the sky for easy identification. The system includes an integrated multimedia player and has the ability to project directly from anothercomputer. Easy access to scripts, with comment header display. The ability to play an audio track in the background. Dynamic placement and manipulation (mirror, rotate, scale, etc.) of images or videos against the sky. The ability to elect a celestial object by name from a sortable, filterable, and searchable database. The ability to adjust colors with a graphical color picker. How will volunteers learn to use the new system? Due to its excellent usability, no special operator training is required other than reading the user manual and using the free lesson plans. Volunteers will use stored programs to teach themselves and work together to learn the new system. Our volunteers are excited about using this powerful tool to create and store great visual astronomy programming for Juneau. The system will be placed next to our existing starball. Projector is operated via a handheld remote control. What System will be purchased? The board will purchse a system from Digitalis, located in Bremerton, WA. Learn more at www.digitaliseducation.com. The first page of the website has a five minute video overview. System allows dynamic placement and manipulation (mirror, rotate, scale, etc.) of images or videos against the sky. System has the ability to adjust colors with a graphical color picker. It is a laser-phosphor based projector with lamp replacements. Laser lifetime is estimated at 20,000 hours on full brightness.